PyeongChang 2018 hailed a success and its legacy lives on! The XXII Olympic Winter Games opened on 09 February with an Opening Ceremony that drew high praise and viewership from around the world. Impressive preliminary viewership figures show 88 million across Europe (as reported by Discovery Communications) and 28.3 million across the United States (as reported by NBC Sports) viewed on multiple platforms. Despite the extreme cold weather, the Games’ positive atmosphere continued in a flurry over the 19 days of competition. Decked out in the red and grey Games’ Passion Crew uniform, Lorna Campbell and Michelle Tan (H+K APAC) were onsite for 30 days to give support to POCOG’s International Media Relations team and its 30 international and local volunteers at the Main Press Centre (MPC) News Desk. Michelle supported the news desk, managing the volunteers, media queries, interview requests and daily reporting and analysis. Lorna was based in the back office dealing with requests for POCOG spokespersons, managing Games communications, developing interview materials, stakeholder engagement and crisis communications. Daily international news monitoring and media analysis were key for the team – as Lorna used the reports as a guide to prepare the spokespersons for the IOC/POCOG daily press briefings. However, it was not all work and no play for Lorna and Michelle. They had the opportunity to watch some of the competitions and experience some of the different winter sports live. Despite many of the events being held outdoors, they braved the cold to see first-hand the passion of the fans in the venues at their first Winter Games. The team will return home on 27 February, for a few days of respite before the PyeongChang 2018 Paralympic Winter Games. 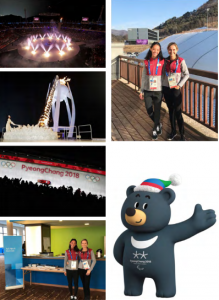 Lorna returns to continue her role at PyeongChang and Michelle will provide vital support from the office and warmer climate of Singapore. The PyeongChang 2018 Paralympic Torch Relay will be the first official event that heralds the beginning of the PyeongChang 2018 Paralympic Winter Games. The eight-day relay aims to inspire the nation and kick off the festive mood before the Games begin: it features 800 torch bearers and 218 support runners. 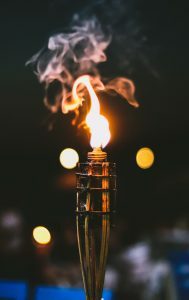 The Paralympic Torch Relay is a powerful way to share the message of the Games around the host country and show some of the iconic cultural highlights of the nation to the world.